I got a job offer recently...and I turned it down. I think I had been pitying myself lately, thinking I was in a slump. Thinking that my skills and work were not appreciated. Getting a job offer really pumped me up and stopped me from feeling sorry for myself. I knew that this job was not the right job for me, so I ended up saying no. Still...it's nice to be asked. Currently, I'm also in San Francisco, working on Hearts on Fire. This week is a lot of stress and work. I'm sure that by the time it ends on July 6, I will be feeling pretty high. I will have forgotten the stress that I'm going through and will only feel euphoria for the good event. I think this happens at every event I go through. I also know that I will feel very appreciated at this event as well. People really like the work that I do. I don't think I'm bragging, because I'm always questioning my work, but others comment on it...and I like to hear those comments. I know that the stress and complaining that I'm going through now will be swept up in the smiling faces of those who will be attending. I sound like I'm giving birth...which is appropriate. This conference has been my baby for 18 months. It's about time that I get to see my work come to fruition. Yes, I'm getting the ego boost that I want. I've been a part of a lot of conversation lately about calling. That may seem really obvious, but after a few conversations, I think I've realized something. Our calling doesn't always look like we think it should. Obvious statement, right? I'm not sure. One of the conversations mentioned Catholic women who feel called to be ordained. When I heard of that, I thought of many friends who struggled to be ordained in the ELCA. That's when I realized that all of these people are called to be clergy, but perhaps not in the way that we think. I'll go with the ELCA example, since I know that much better. Those clergy who have not been recognized or rostered by the ELCA have continued to follow their calling. However, they have taken a path with much more struggle than others. Their calling is not just where their deep gladness meets the world's deep need. Their calling has come in the face of an obvious roadblock. Some leave...some persevere...some are ordained...and some still wait. But each is following a calling. A while ago, Richard and I were talking about our futures and where we would like to go from here. We often felt that we had planted deep roots in the Twin Cities area. We established a good network of friends, and many of my friends from high school and college were around the Twin Cities. However, lately I've been aware of the exodus of my friends. It started a couple of years ago when one of my best friends got married and eventually moved to South Dakota. Just a few weeks one of my other best friends packed his car and moved to the east coast. And currently, another very close friends is in the process of moving back to Northern Minnesota. Quite honestly, I considered these three people to be my best friends. At one time, we were relatively near each other. We could visit one another or meet somewhere. Now, they are scattered across the US with other lives to occupy their time. Only I have remained here. It's funny, because I always saw myself as a transient person. I didn't think that I would stay in one place so long. Sometimes, I can't believe that I'm the only person who has stayed put while my friends have moved on. But I think that my friends were a part of the reason why I felt so rooted in this place. Now that they are gone, what is holding me here? Security? Tradition? Fear of relocating and finding a job? Sometimes I long to be a free spirit, just roaming around finding work as it comes along. Other times, I am thankful that I don't deal with the uncertainty of not knowing where my next paycheck is coming from. I have grown up. I live a responsible, adult life. Can I still have a sense of adventure? I certainly hope so. Thanks for letting me take my break from blogging. I can't promise that I'm going to be consistent. I have a very full schedule until about mid-July. There are two major events coming up, one at work (the high school youth theology institute) and Hearts on Fire (which you have already missed registration...poor schlubs). But what do I want to focus on today? Perhaps the epitome of a suburban existence. Tonight I drove out into the farther suburbs to watch my goddaughter in: The Three Hour Dance Recital! Just so you know, that's not my goddaughter. That's just some girl whose parents thought it would be cool to put her photo on the internet. 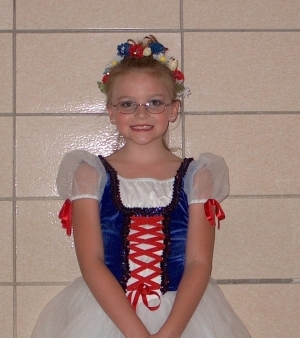 The difficulty with a three-hour dance recital is that I'm really there for only about 15-25 minutes of it. My goddaughter had two dances (one in each act). Her sister also danced, so I knew two kids on stage. Other than that, I was watching a bunch of strangers. The senior high dancers were very good. I guess I like dance, so I was pretty entertained. However, for some reason, my eyes area always drawn to the one girl who is way off from everyone else. Here's the really mean thing: I also look for which girls look the most unflattering in those costumes. I have a co-worker whose daughter does dance, and she makes jokes that the costumes make the children look like trollops, but parents still send them out there. These are clothes that parents would never allow to be worn to school or another function. But somehow it's OK that they are dancing around on a stage in front of hundreds of strangers. All in all, it was a nice evening. Both girls danced quite nicely. As I mentioned, I was more impressed with the older girls, who had good routines and were all together. I guess I don't care a lot for "cute", so I wasn't as impressed with the 3-4 year olds (who wants to send their child to dance classes at 3?!?!?!). Perhaps the highlight was the father/daughter group. This was the only time that a male was represented on the stage. They did a cute number to "Hero" (both Bonnie Tyler and Enrique Eglasias). The fathers were all dressed up like super-heros (Batman, Mr. Incredible, even Austin Powers). It was quite funny (and I'm glad that I'll never do that). So parents of daughters...beware of dance!